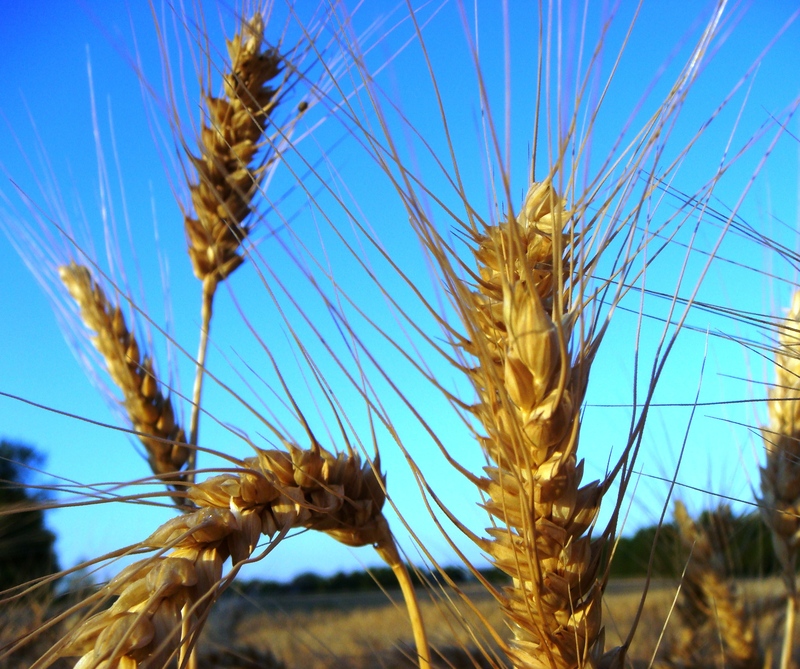 Wheat, the staff of life, and so much more. The green blades to golden grains not only provide food for the world (sorry to all those who are gluten intolerant), but create a collage of beauty as they germinate from bright green sprouts in the winter, then grow into light green stalks in spring, and eventually turn into golden strands with prickly heads of grain in summer. Wheat is at its most exquisite best when a gentle breeze blows the mature stems in patches of waves that seem as light as clouds. Mesmerizing to watch. When shafts of early or late sunlight ply across a wheat field, an intense gold color presents itself in majestic panorama. Absolutely beautiful. And, when the combine or scythe take down the grains in early summer, the transition from a dormant seed to a life-giving grain is powerful. Quite transforming. To witness the staff of life develop from seed to strand is nature’s art in progress. I count this process a privilege to witness every year. So, I encourage you to grind some wheat, knead some dough, bake a loaf, and enjoy a hot slice of bread with a fresh pad of butter on it. Yummy to be sure, and one of life’s simple pleasures! Whenever I think about St. Patrick’s Day, my mind immediately goes to an old friend of mine. His name is Mark Manning…Irish through and through. My friend in not physically with us anymore. He left us almost three years ago. It doesn’t seem that it’s been that long, though. Occasionally, we are blessed to cross paths with a truly remarkable person. Mark was this and so much more. I could easily lavish a plethora of positive adjectives concerning this unique and gifted man. However, I will share only a couple of his most endearing qualities. 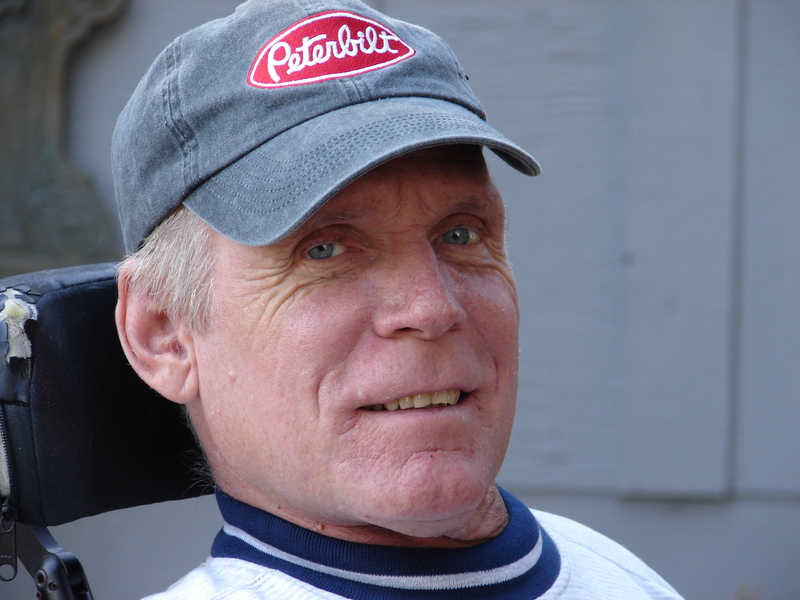 I almost failed to mention that Mark was a quadriplegic, an accomplished artist, history teacher, and faithful servant of Christ. Mark entered my life, or I should say we crossed paths, while attending the same church many years ago. One of my fondest memories is when he invited me and Cheryl to attend his family’s St. Patrick’s Day gathering. This was an honor, and a rather large gathering, too. The Manning clan is numerous and knows how to throw a good St. Pats party! Mark’s brothers, sisters and mom are the most welcoming group of people I have come across. Mark stood out among them all. He engaged us from the moment he noticed we were at the clubhouse. He made us feel comfortable, and talked to us like we were old friends. Not many people have this ability. One of the qualities I want to share about Mark was his unassuming, and humble personality. Although he sat in a wheelchair, he was the tallest person everywhere he went. He reached out to others and made them feel special. He always asked how one was getting along in life, and he meant it. He would encourage. He would teach without you even knowing it. He would point you in the right direction, and encourage you. I never walked away from spending time with Mark saddened because he was crippled physically. Instead, I always left him a better person than when I greeted him. Amazing how he had that effect on everyone. Mark was an inspiration. He accomplished more than most, and without the use of his legs and only with very little function of his arms and hands. As I mentioned, he was an excellent artist who used the medium of watercolors to express his inward poetry. Mark created an annual community outdoor art exhibit which was sponsored by his city and local businesses, and which received much recognition. He majored in art history and shared his passion with others. He became a Christian and was responsible for leading his family and many friends to the Source of his strength. For those of you who know the difficulties of paralysis, Mark handled this disability with strength and grace. He was forced to rely upon the aid of others to perform even the most mundane personal tasks, yet he maintained his dignity. Finding reliable and good care was always a challenge, but he never complained about that. In fact, I don’t ever recall Mark complaining about anything! Being around him was refreshing. Mark was a great listener, and offered wise counsel, but not too much of it. He was insightful and could be firm when necessary, but was gentle by choice. I miss him. I miss his smiling face and kindness. I miss his advice. I miss our fellowship. However, I don’t miss his physical handicap, and am so looking forward to seeing my friend run and jump and walk when I reach my final destination. I am confident that Mark will be among many who will greet me. What a day that will be! Happy St. Patrick’s Day, Mark.